It's been a while since I put a recipe up on my blog, mainly due to the fact I've been changing my diet to a healthier one so all I ate last week was omelettes, salads and pitas. Now that I've actually stuck to it for more than a week, I'm trying to incorporate healthier and more filling meals into my diet. With summer being just around the corner (and already started for some) I thought I'd do a mini weekly segment with some healthy and easy recipes for y'all to try. 1. 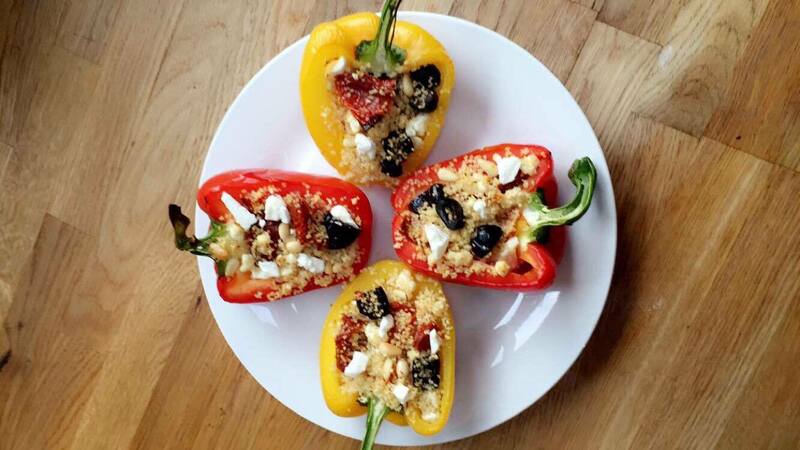 Pre-heat oven and place whole peppers in the microwave for 5 minutes so they are soft. Cut them in half and place them on a baking tray, scooping out the seeds etc. 2. In a measuring jug, add the cous cous with 150ml of boiling water and cover with cling film for 10 minutes. 3. Mix the cous cous to separate the grains and add some olive oil. Mix in the chopped up sun dried tomatoes, olives, pine nuts and the crumbled feta cheese. 4. Fill each pepper with the mixture and sprinkle some basil on each one. 5. Place in the oven for 10 minutes and enjoy!